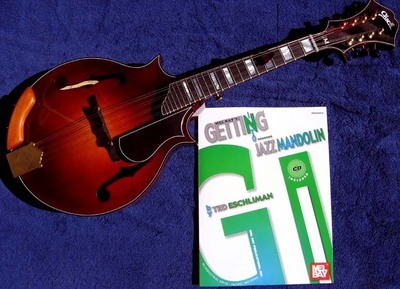 Order the book in our JazzMando Merchandise Center. Note: Because of the 70 minute audio space limitation on the book's CD, we were limited to running the full exercises of the Major and Minor 'ii V7 I' patterns to only the first of the set of four; each subsequent one was excerpted. As a bonus we are offering full accompaniment tracks on all eight of these (without mandolin), as well as the Turnarounds accompaniment tracks here in an MP3 format. We are also offering additional examples of some of the above (along with the Dorian Patterns and How High the Minor 2nd with guitar and bass accompaniment. Feel free to load these to your MP3 player and jam to your heart's content! The book contains five original tunes to introduce specific pedagogical concepts, including modal improvising, advanced blues, and shifting tonal centers. In preparing the accompanying audio CD, we thought in addition to the demo tracks of the exercises and the song jam tracks, it would be helpful to hear an "end product," complete performances of these in a "real life" context. No one better to do this than Don Stiernberg, personal mentor and consummate jazz mandolin professional. Three of the following are from the instructional CD, with the two additional "bonus tracks" we had to leave off because of space limitations. Enjoy! The following is a work in progress; we've enlisted the contributions of some of the world's best mandolinists in presenting their interpretations of the five song tracks. As these (and others) are submitted, we'll post them. Keep checking back with us! 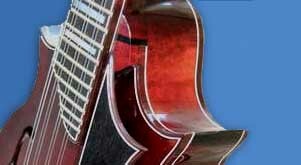 Solo Mandolin Tracks (1-11, 15-22) recorded by author on Phoenix Jazz Mandolin, Arrow Jazzbo 4-string, Rigel (blueburst) CT-110, and Mix New-Mad a5. Accompaniment for 13 and 23 recorded on Old Wave Solocomp JM (Jazz Mandola). 'ii V7 I' Majors, 'ii7b5 I' Minors, and Turnarounds (24-31, 31-36) recorded by author, guitar accompaniments John Eubanks.